Project Day | It's Project Day! There are a TON of things that people use every day made from flat materials… tables, cookie sheets, bookshelves, wooden Santa Clause puzzle kits, picture frames, and even this MDF rocket. Sure factories use automated power saws, die cutters, and tools that cost more than your house, but that’s only because those tools are required by manufacturers to keep their costs per item down. If you only have to make one of something, your technique doesn’t have to be so sophisticated. Even CNC machines and 3D printers can be overkill. The only tools you’ll need for some DIY projects are a sturdy work surface, a saw, and a drill. There are many ways to use sheet material to make structures and they all use some combination of opposing forces to make the structure strong. One of the most common (and my favorite) is to use columns between plates to expand the flat dimension of your material. This does two things: First, it makes even a flexible plate more rigid (stronger) the same way an I-beam gets its strength from three relatively thin plates (in engineering terms, this increases the moment of inertia without increasing the weight). Secondly, it adds a lot of volume to what you are making without adding much weight. On a large scale, you could use PVC pipe, a few washers, threaded rod, and some nuts to make the columns. The opposing compression in the pipe and tension in the threaded rod make the column super strong, stable, and rigid. Another joinery technique is actually the subject of this project day: the half-lap rocket. The idea here is to cut opposing grooves in material so they fit together like a puzzle. When the two pieces are joined together, the structure will be very strong because a force that would bend an unsupported thin plate in half is being opposed by the other plate not wanting to bend along its edge. 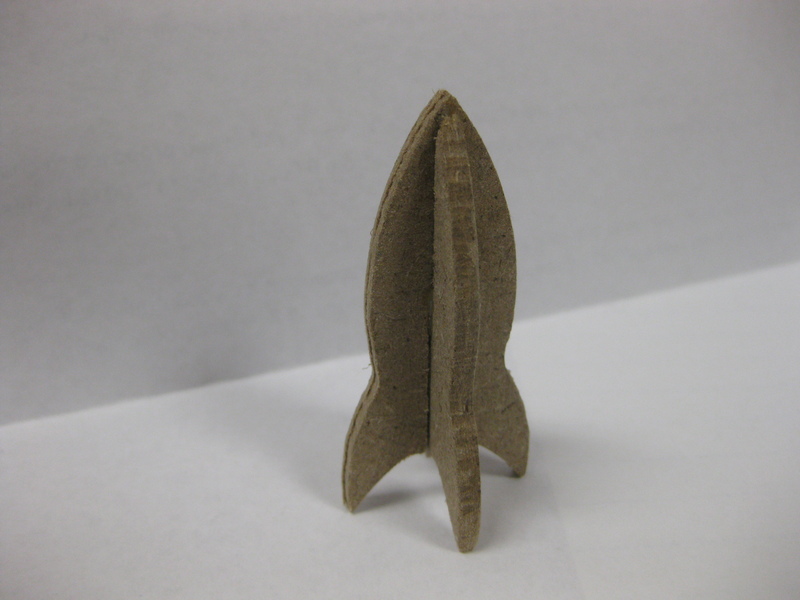 One of my favorite projects lately has been some small MDF rockets made out of two cutouts in 1/8″ thick material. The outline of each one is identical and the only difference is that one piece has a slot from the top to the middle and the other has a matching slot from the bottom to the middle. When you put the two pieces together, the rocket is free-standing and 3-dimensional. The best part is, you can make the same figure with some MDF and a coping saw, just follow these simple steps! 1) Draw the object you are going to cut out. Feel free to make anything you like. The guiding principle for the rockets was to make them symmetric with the half-laps made on the dividing line. If you want to use my design to make a rocket ship, print this PDF. 2) Cut out the shapes. Make sure the cutouts are as clean as possible. They will become a stencil in the next step. 3) Trace the stencils onto your material. Remember, the slots won’t work unless the material and the slots are both about 1/8in thick. If your material is a different size, adjust the slot width to match. Make sure to leave some room around the tracings so your cuts in the next steps won’t start right next to the finished cutout. 4) Use a coping saw to cut between the two tracings and cut away most of the excess material. The idea is not to start cutting on the lines of the tracings, but rather to leave room so your cuts aren’t starting right next to the cutout in the next steps. 5) Using a drill, drill a 1/8″ hole at the end of each of the two slots, this will make it easier to finish them. If you don’t have a drill available, you can use a back and forth method to clear the material from the end of the slot in step 7. 6) Make your detailed cuts by cutting lines from the edges of your material to the sharp inside corners. Remember, coping saws can cut contours just fine, but it won’t cut hard angles easily and could even break your blade. Make multiple cuts to take the excess material away in wedges or strips. 7) Now that the exterior of the tracing is gone, cut the grooves. If you have a piece of thick scrap with a straight edge, you can clamp it to your cutout with the edge right on the line of the groove so as you cut, it will make sure the blade doesn’t go too far astray if you lose your line. 8) With the two halves of the rockets done, you can sand the edges smooth, put them together with a little glue in between, and you’re done! If you’d like to add some finishing touches, you can paint them with a crazy design or add some LEDs for a more retro high-tech effect. I find its best to use a cutting guide to improve the precision of my cuts and make life easier in general. You can make one with a long strip of scrap. Thick, rigid material is best. Mine is made from a scrap of aluminum plate. 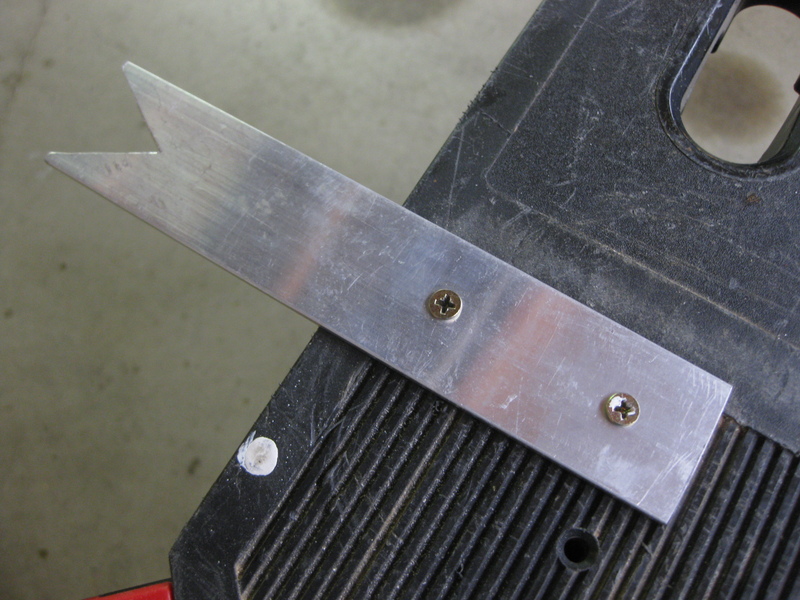 Cut a V in one end of the scrap at about a 60 degree angle and secure the other end to your work bench. As you cut, if you keep the saw blade close to the crook in the V, there will be more support on the material, so more of your energy will go into cutting and less into keeping the material flat on the edge of your bench, allowing you to control the direction of your cuts. 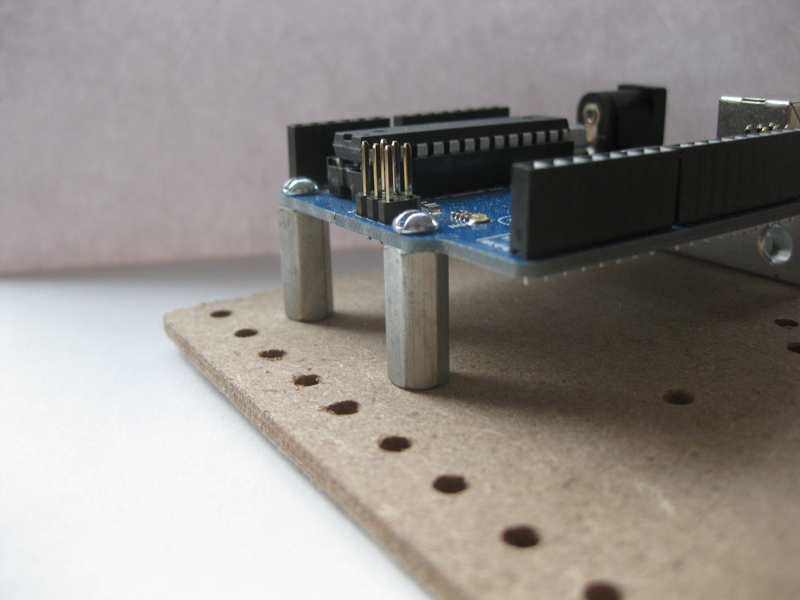 Using the techniques here, you can make a LOT of things from mini animals to project enclosures. The possibilities are as limitless as your imagination. That was my project day, how was yours? Did you like It’s Project Day? You can subscribe to email notifications by clicking ‘Follow’ in the side bar on the right, or leave a comment below. Think twice before throwing out your old tech. Perhaps that disused piece of junk can have a second chance in your next DIY project. Let’s rewind the clock to 2001: NASA lands the first spacecraft on an asteroid, Gladiator wins the Academy Award for best picture, and Handspring releases the Handspring Visor Neo, the company’s affordable PDA competitor of the Palm Pilot. At the time, this baby was screaming (for hand-helds) with a 33MHz processor, 8MB of RAM and a high resolution 160×160 pixel gray-scale display. The following year, I was lucky enough to get this high-tech piece of portable technology as a barter deal for helping a neighbour understand how to use their own PDA. I kept my Visor in working order over the years and it was still limping along when smartphones became affordable and I didn’t need it any more. After it was clear that my old friend was no longer useful as a practical tool, I looked into selling it on eBay, but found more equivalent devices that went unsold than sold so I had the choice of either throwing it out or trying to find something else to do with it. Since I’m not inclined to ‘e-waste’, I started digging around for potential ways I could repurpose it on the internet. Handspring made it’s niche in the PDA market with their springboard expansion slot, so I was really interested in figuring out how to hack it (the device has a docking interface and an IR transceiver, too). Given its age, I had a LOT of broken links to sort through, but I eventually found NS Basic Palm, Pocket C palm, Palmphi, and Palm OS Emulator. It took a while, but I was finally able to hijack the emulator from POSE and use a ROM that I found online to use for exploring the potential of the programming languages on the go. I found out that Handspring once had a development kit for the springboard expansion slot, but was disappointed to find that it was no longer available from Palm. While I was excited at the prospect of writing apps for a new platform, I realized that there was no way I’d be carrying the Visor around with me on a daily basis, so aside from can-I-do-it curiosity, the Visor was doomed to be recycled. The turning point was when I discovered that the Handspring PDAs (and I suspect other Palm Pilots as well) used serial protocols to sync data with the PC. If you look at the circuit board inside the serial docking station, the connection is direct from PDA to PC. I suspect that the only addition the USB docking station brings is an FTDI. The most exciting discovery was that Pocket C had a couple functions allowing the Visor to establish the serial connection and push data independent of syncing. I suppose I should have figured that this was possible since the Targus Stowaway keyboard connected through the docking port. This was such a revelation: If serial comms was possible, then I could connect this little computer to anything with a serial port… The possibilities were endless. I decided that the best thing I could do was to relieve my computer of the burden of driving my Lynxmotion robot arm. Since the development software I had didn’t include objects like buttons and sliders, I created my own. Using basic drawing features like boxes, lines, and text, I was able to create a GUI with buttons, indicators, and a slider so I could engage the serial port and individually control each servo in the robot. 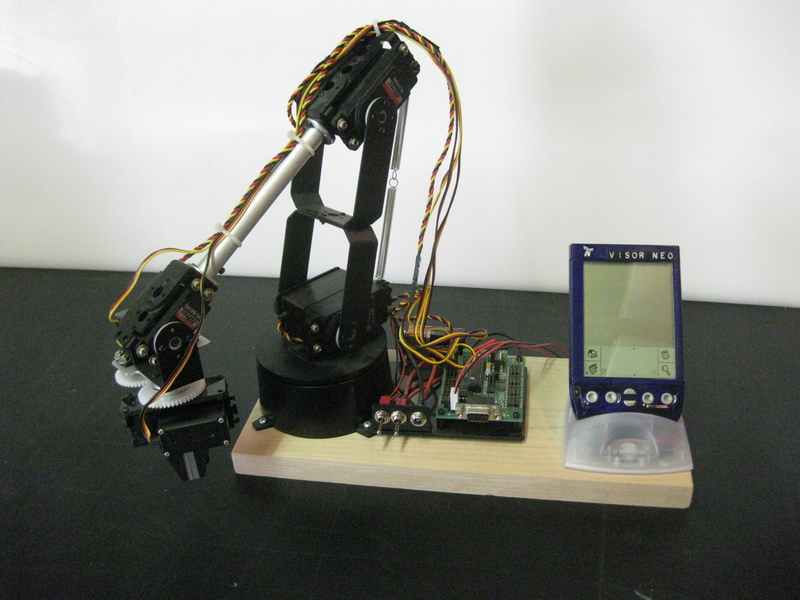 In the process of developing my program, I realized that I needed a controller that could read data from sensors if I wanted the arm to do anything useful, so as it turns out the Visor wasn’t a good fit for the robot arm in the long-term, but the device had proven itself. Who knows what else I might be able to use it for in the future? Maybe it’s going to be my next universal remote control? I still haven’t figured out how to dig into the springboard expansion slot, but I suspect that it’s going to unlock an even bigger potential for my little friend. 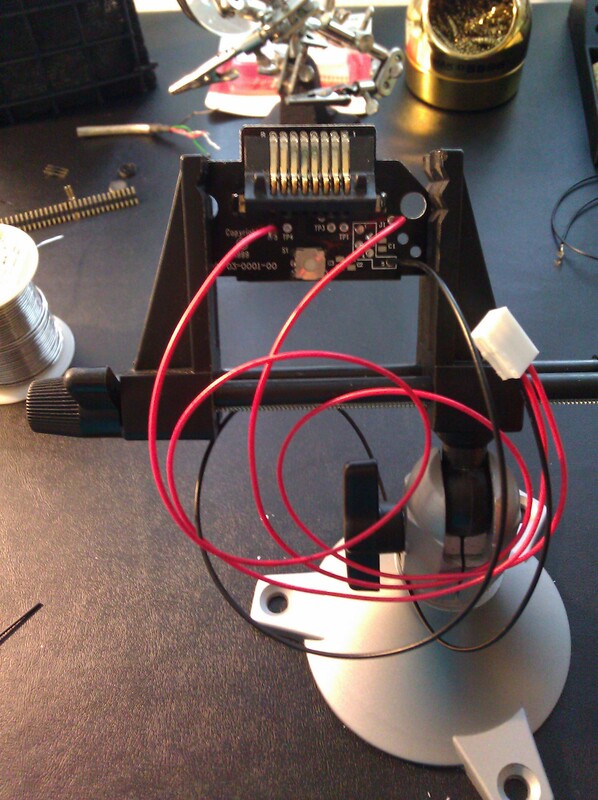 Perhaps the next step is to reverse engineer the GPS expansion I bought years ago, but could never get to work. The big lesson I learned here was your next project doesn’t have to start as $100+ in new electronics, maybe it starts with that old gadget you have laying around with lots of hidden potential. Baby + IFTTT + Google Assistant = Awesome!